Beef, sauce, dark brown sugar, soy sauce, teriyaki marinade sauce, water, pepper sauce, italian black pepper, garlic powder, salt, potassium sorbate, ground ginger. The first thing I taste from these pieces is a moderate sweetness, with faint bits of teriyaki and black pepper. The chewing brings on more sweet, along with a bit more black pepper. I can also pick up a light garlic and subtle hints of other seasonings. 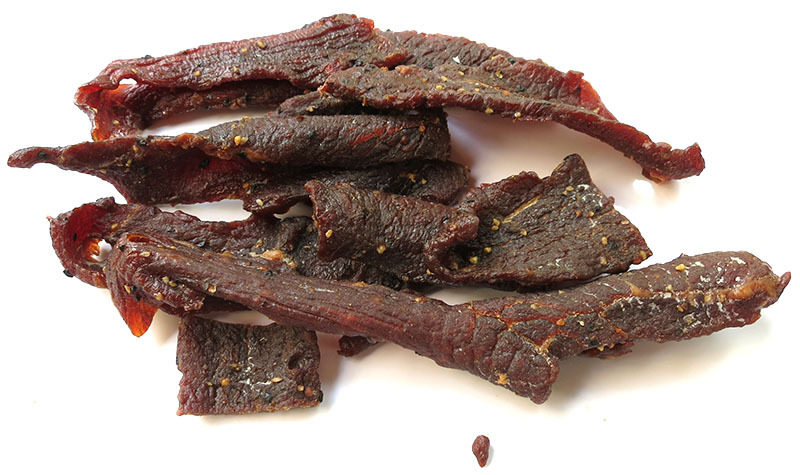 Compared to the previous recipe, which was more like a sweetened, black peppered jerky with a light soy sauce, this new one tastes more like a teriyaki beef jerky, with a significant cracked black pepper spice. Overall, both the old and new recipes are still strong on the black pepper, with the old having a light soy sauce marinade, and the new having a prominent teriyaki marinade. This new recipe certainly seems to be an improvement over the old. It's not quite as spicy hot as the old (level 2 out of 5, versus the previous level 3), and the use of teriyaki sauce is definitely tastier than the sweetened soy sauce that the company used before. The meat consistency seems improved as well. This new recipe uses longer strips, with a moist-sticky surface feel compared the previous drier feel. The chewing texture is far improved, feeling much more meaty, and perhaps a bit like steak. 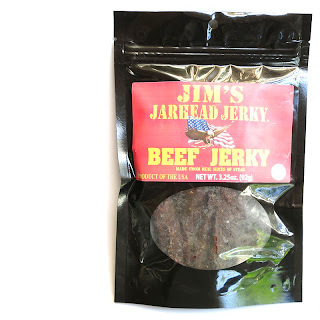 Verdict: Jim's Jarhead Jerky is comparable to a teriyaki style beef jerky, but with a significant black pepper spice. We like the meaty, somewhat steak-like chewing texture, and the tender, easy eating. It's considerably improved in both flavor and meat consistency, and seems to set itself above the mainstream teriyaki jerky brands out there. 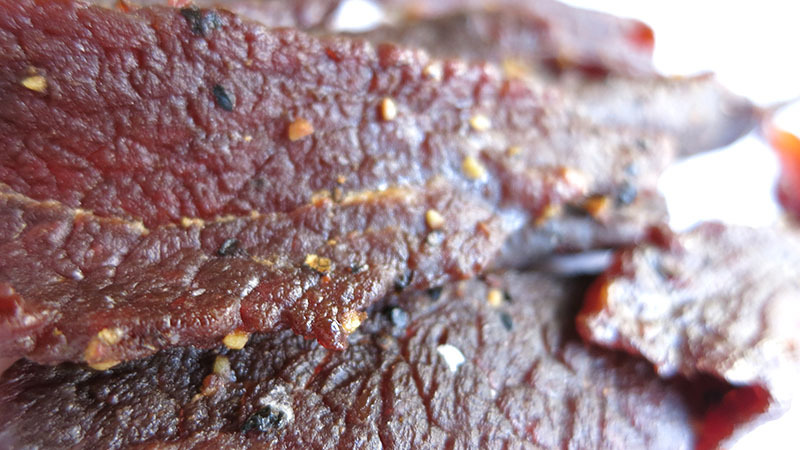 Compared to gourmet teriyaki jerky brands however, the flavor seems comparable, and not out of the ordinary. We're happy, however, to give Jim's Jarhead Jerky an improved rating.